SURPRISE! I have a new release!!! Remember those collections of short stories I wrote and released last year for the holidays? Well, they’re back! So if you didn’t get to read them, you can now. PLUS there are 2 Halloween stories added, including a CHOOSE-YOUR-OWN-ADVENTURE. Remember those from the good ol’ days? AND, holidays are all about the food, right? This new edition of Wonder includes 48 holiday recipes from myself and members of my amazing street team. ***EXTRA BONUS: Proceeds from October sales will be split for donations to causes for Domestic Violence and Breast Cancer Awareness Months. 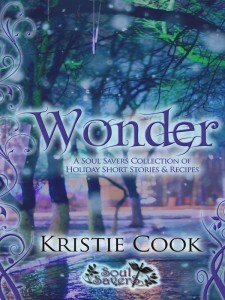 Get your copy of Wonder: A Soul Savers Collection of Holiday Short Stories & Recipes today! Enjoy your Halloween treats with a scary story from Tristan and Alexis and a choose-your-own-adventure where you get to decide your fate—supernatural or human. Stuff yourself full with three Thanksgiving stories about a baby vampire yearning for a traditional feast, a lost werewolf who finds love, and Tristan, Alexis, and the crew struggling to enjoy dinner when the enemy attacks. Open three gifts that include a Daemoni warlock finding her own way to celebrate anti-Christmas, a vampire converted to the good side who discovers the miracle of Christmas, and a special, fan-inspired story from Tristan – winner of multiple best hero/best book boyfriend awards, including UtopYA Con 2014 Best Supernatural Hero. Finally, ring in the New Year with a were-romance, a party that tests four witches’ resolutions, and your favorite couple struggling to grab their midnight kiss.